One in nine Californians is a resident of the Inland Empire, a Southern California region comprising Riverside and San Bernardino counties. With a population of 4.5 million people and counting, the region in many ways serves as a harbinger of California’s future. So what does it say about its workforce? A new report from the Center for Social Innovation at the University of California, Riverside, provides a detailed look at the region’s economic landscape and workforce trends. The report, authored by a team of researchers from the center’s Economic Mobility Group, was released Tuesday, Nov. 27, during a public launch event. Findings outlined in “State of Work in the Inland Empire” suggest job growth in the region is climbing at a strong and steady clip, and at a rate faster than the statewide average. But progress remains to be made: To start, the majority of Inland Empire jobs could pay more to support working-class families. “There are significant efforts underway — involving business leaders, public agencies, civic leaders, and advocates — to vastly increase the number of middle-class jobs in the region,” said Karthick Ramakrishnan, director of the Center for Social Innovation and an author of the report. Ramakrishnan, a UCR professor of public policy and political science, said just 38 percent of the region’s 1,426,000 jobs pay a living wage. In the Inland Empire, where poverty rates are higher than the statewide average, the problem is especially severe for communities of color, with Hispanic and black workers least likely to earn a living wage. 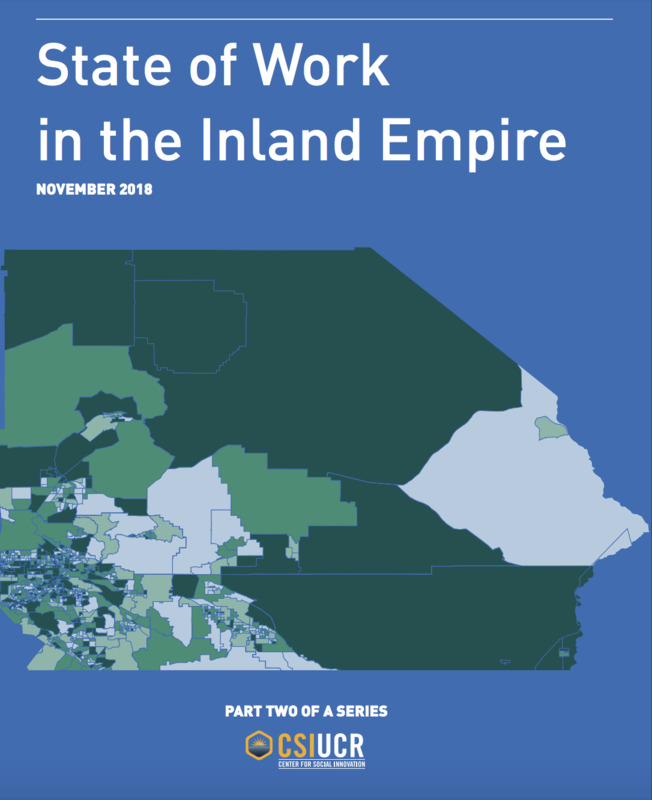 The Center for Social Innovation's "State of Work in the Inland Empire"
The lack of higher-paying jobs has driven about 351,000 Inland Empire residents to seek employment outside the region, namely in neighboring Los Angeles and Orange counties, said UCR sociology professor Ellen Reese. Reese, another of the report’s authors, explained that workers who commute out of the region for their jobs tend to be more educated and less likely to live in poverty than those who live and work in the Inland Empire. The Inland Empire’s unemployment rate has fallen to just 4.1 percent since its Great Recession-era peak of 14.4 percent in 2010. Although the growth of the healthcare sector has added many relatively good-paying jobs in the region, many of the 300,000 jobs added since then are in industries that tend to offer lower-wage, seasonal, or part-time work. These sectors include transportation and warehousing, construction, retail, and food services. According to the report, which opens with an overview of the Inland Empire’s economic history, the logistics industry has swelled since the 1980s and ’90s, a period that also saw the decline of regional manufacturing and local military investment. Although the Inland Empire’s booming healthcare sector has gained the most jobs (85,000 total) in terms of absolute growth since 2010, the logistics industry has expanded at the fastest rate, more than doubling during the same eight-year period. Due to the nature of jobs that dominate the region’s economic landscape, fewer Inland Empire workers are employed full time and/or year-round than in Los Angeles and Orange counties, and statewide. Only about a quarter of the region’s workforce reports having a bachelor’s degree or higher. Still, Ramakrishnan said there are plenty of educational attainment factors and forward-thinking programs in the region that call for an optimistic outlook for the Inland Empire. At the report’s launch, he emphasized the presence of dozens of four-year colleges in the region, which collectively produce thousands of highly skilled graduates each year. In fact, more than 12 four-year colleges exist within a 25-mile radius of the city of Riverside alone. In addition to higher education access, the report tracks the development of several innovative strategies to attract and grow talent. Local colleges and city organizations have joined forces to develop internship and mentorship opportunities to ensure quality job placements. The report’s authors said a mix of economic and workforce development strategies will be integral to ensuring more Inland Empire workers are properly matched and placed with the kinds of employers who offer stability, higher wages, and benefits such as health insurance. In particular, they identified career pathway and technical training programs as promising initiatives. Reese, who serves as chair of UCR’s labor studies program, also highlighted the importance of efforts to strengthen worker protections, such as unionization. By unionizing, workers gain the power to collectively bargain for higher wages, better insurance coverage, and paid vacations — and according to Reese, employers benefit, too. “Employee turnover tends to be less when working conditions are better,” she noted. 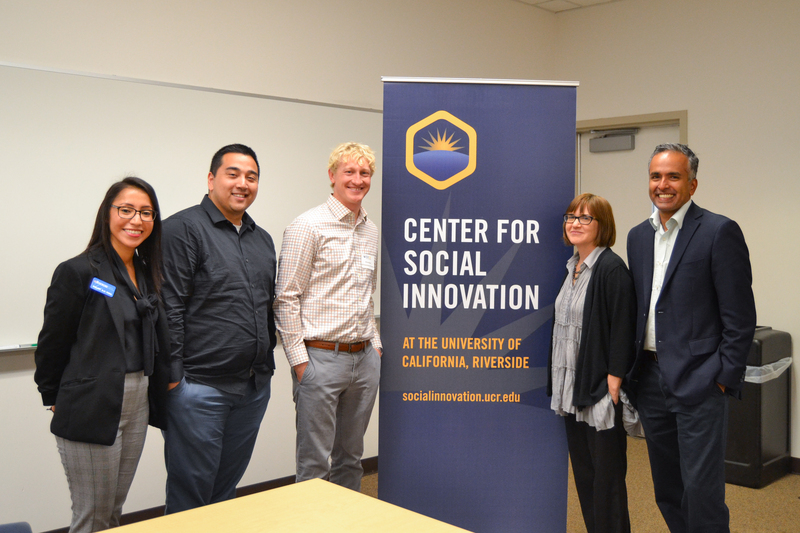 More about the Center for Social Innovation: Housed within UCR’s School of Public Policy, the Center for Social Innovation aims to provide a credible research voice that spurs civic leadership and policy innovation. The center is a breeding ground for collaborative projects that boost collective impact — all with the primary goal of shifting away from a “problem” narrative to an “opportunity” narrative for marginalized communities and localities.